An Adder in GTA V.
The Truffade Adder is a supercar in Grand Theft Auto V.
The Adder is heavily based on the Bugatti Veyron 16.4 Super Sport for the general shape, the greenhouse area, rear bumper area, and side windows. The design of this car has some resemblance to the Saab Aero-X for the wheels, headlamps, and front fascia. The taillights are based off modern Aston Martin vehicles like the Aston Martin DB9 and Aston Martin Vanquish, as they are C-shaped taillights. Some elements of the front and sides of the car appear to be inspired by speculated Super Veyron illustrations. Also, the Adder features two racing stripes, much like those of the Ferrari 430 Scuderia. The car's front appears more like the speculated concept. The front bumper features large ducts near the base. The bumper's bottom edge is raised for the width beneath the main grille. The main grille is a wide, curved trapezium-like element. The Truffade emblem is mounted centrally on the grille. The car's headlight units that are similar to those of the Felon GT. The sides of the car are made up completely from curves; the wheelbase has a long impressed area not far above it, leading to an air duct and above this is a main body curve which runs along the base of the door and then heads up to the top of the car's sides. The wheel arches feature flat faces but are heavily flared from the body at the rear. The windows continue the curvy theme of the car's design, curving downwards towards the rear. The roof features two ducts which have been almost directly taken from the Veyron 16.4 Super Sport. The rear of the car is similar to its real life counterpart in that it features a completely curved outer profile. The engine cover area however has a central vertical fin behind the rear windscreen. The rear face features a central brake light strip at the top with two wide C-shaped lights on either side, with their top edges coinciding with the bottom edge of the central strip. The rear lights are fully red, having no clear indication of allocation for reverse lamps. The license plate is mounted centrally between two wide D-shaped air ducts that help the engine breathe. The base of the rear bumper features a large polymer-covered area with two large quadrilateral-shaped exhaust tips mounted centrally. Unlike the real-life Bugatti Veyron 16.4 Super Sport, the Adder doesn't feature an active rear wing that deploys at a certain speed. According to legendarymotorsport.net, the Adder is powered by an 8 liter 1,100 HP engine (may or may not be a W16). As befitting the car's real life counterpart, the Adder has the highest top speed of any car in the game: 250 mph (403 km/h). While capable of reaching blinding velocities, it is very heavy, giving it below-average handling, slightly negated by an all-wheel-drive layout which helps jolt the car quickly and help its otherwise low traction rating. Its acceleration is also slower than most other supercars; it only takes 3 seconds for it to go from a stop to 60 mph (97 km/h), only faster than the Osiris. As a mid-engined car, the Adder is unlikely to break down from collisions unless the engine has been exposed or the engine is damaged by weapons. Contrary to popular belief, examination of the Handling.meta file shows that the Entity XF should statistically be faster than the Adder. Can be bought from Legendarymotorsport.net for $1,000,000 in singleplayer and in multiplayer. While you cannot steal Devin Weston's Adder from his house after Blitz Play (the 'enter vehicle' button (Y/Triangle/Enter) doesn't do anything when pressed and the gate will not open anyway), it is possible to steal it at the beginning of I Fought the Law.... When driving up to the D symbol at the construction site, stop and get out on the footpath before the terrain changes to dirt (any closer and you will trigger the mission). You can see the Adder, Devin, Molly Schultz, and another car clearly from there. Throw a grenade or fire an RPG at the other car, aiming to the left. If done right, the explosion will destroy that car, kill Devin and Molly, but leave the Adder relatively undamaged, and free for you to take. You'll most likely gain a two-star wanted level in the process. If you switch to Franklin Clinton, he might get a scenario where he is stuck in traffic in Downtown Vinewood with a black and silver Adder next to his car. However, this is a quite rare scenario. Spawns at Portola Drive, in the same location as in singleplayer; possible only if there is another Adder nearby to act as a spawn seed. However, since it is valued at significantly over $100,000, it is fitted with a tracker and cannot be stored in a garage. Can be bought for $1,000,000 from Legendarymotorsport.net. The Adder shares its name with a venomous snake native to Europe and northern Asia. Its cost of $1,000,000 currently makes it the second most expensive car in GTA Online, beaten only by the Osiris' $1,950,000. The default radio stations of the Adder are FlyLo FM & Soulwax FM. The front fascia of the Adder is very similar to that of the Lampadati Felon and the convertible Felon GT. The Adder's in-game engine sound is shared with the 9F Cabrio. Both the Adder and Felon lack driver foot pedals. The Adder's rear turning signal is combined with its brake light, similar to the Stanier. The weight of the Adder is 8 kg (17 lbs) lighter than its real life counterpart, with a weight of 1,888 kg (4,162 lbs). 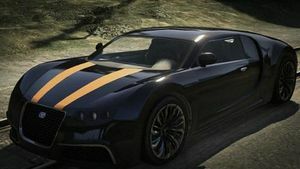 The Adder located on Portola Drive is a reference to the Bugatti Veyron Grand Sport Bijan Pakzad Edition. They are both parked on the same spot in the street. Rear quarter view, pre-release screenshot. This page was last modified on 2 July 2015, at 04:50.